What’s red, adorable, has seeds, and smiles for the camera? This session was a little different than my normal NYC Newborn Photographer sessions, but unique is so much fun. This session was SO fun! Halloween is my absolute favorite time of the year for taking pictures because it makes me glow when kiddies visit the studio in their costumes. I have seen an array of costumes, from Batman to cute little strawberries. Olivia is actually going to be trick-or-treating as a strawberry this year. 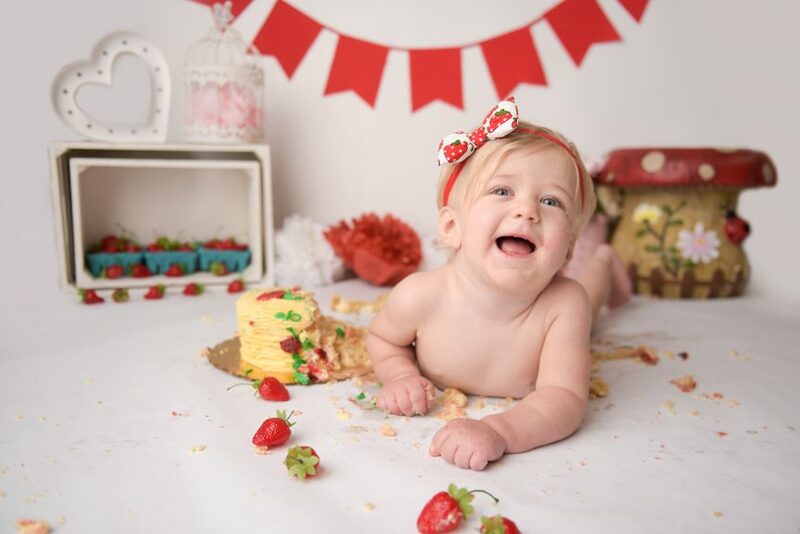 When her dad inquired about doing a photography session with me, it just fit so perfectly that we would make the entire session about strawberries! Instead of dressing her up as a strawberry, we decided we would just put her in a cute little strawberry field! When I designed the set, I thought about everything that would go into a strawberry scene. Of course, I bought strawberries to start! Lots of strawberries. I also designed the set with many little garden decorations, such as a mushroom stool, lady bugs, and some flowers as well. For the smash cake itself, we actually had a strawberry cake, decorated with strawberries and vines, and ready to dig into! Olivia came prepared for her session by bringing a matching strawberry dress, cute with blue plaid squares. The scene is decorated with plenty of strawberries for both decoration and for eating of course as well! Throughout our entire session, Olivia, whom her dad has called her Baby Olive, enjoyed strawberries and sat quaintly among our strawberry scenery. As a NYC Newborn Photographer, I enjoy seeing my clients grow up from newborns to one year sessions. 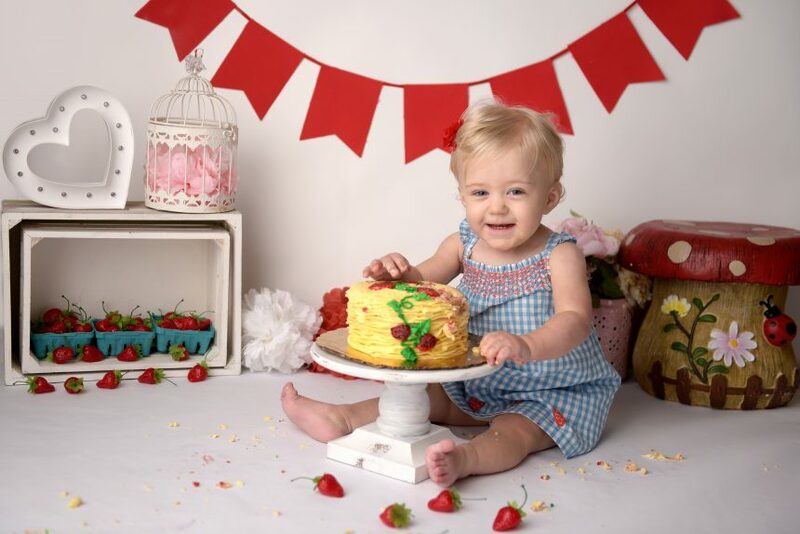 These cake sessions are a great way to celebrate one year old! 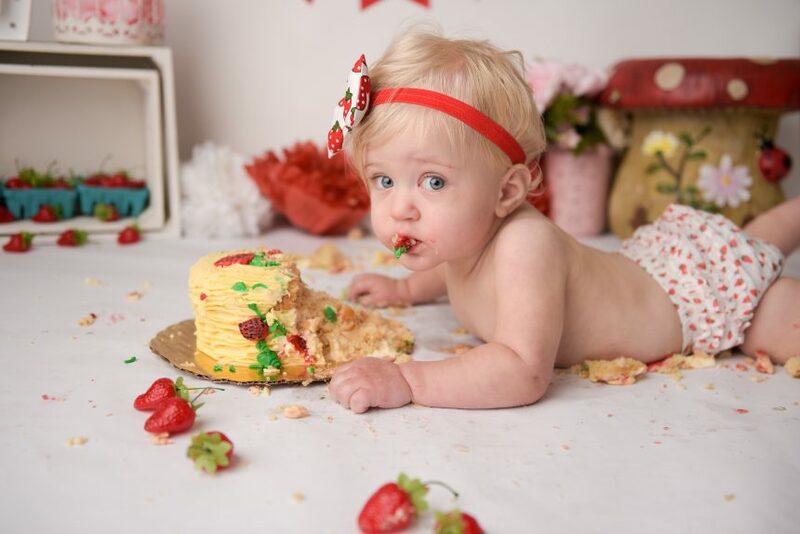 To book your cake smash or newborn session today, click here.